Nobody can claim that Italians are not civilized but Iraqis apparently must be brutal hordes. Not at all! It's not a question to be civilized or not to hang up cadavers of swines. It's a question what crimes they have commited to end on the wire. 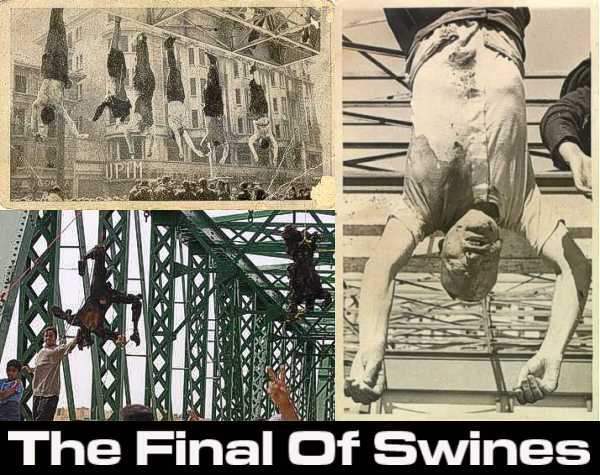 Mussolini was a criminal murderous swine so the civilized Italians let him hang like a slaughtered sheep. The four Americans were murderous mercenaries by order of Pentagon to make the dirty job for US colonization troops keeping a clean slate. And the American swines termed as policy maker already salivate for revenge. What a mockery, they kill thousands and squawk for vengeance, maybe in nice american tradition with a spot of naplam. The Americans are slaughtering people not longer only outside of law but now also outside of public using private death squads from US companies. There are really hanging not enough of this murderous criminals and sadly not one of this American political offenders.